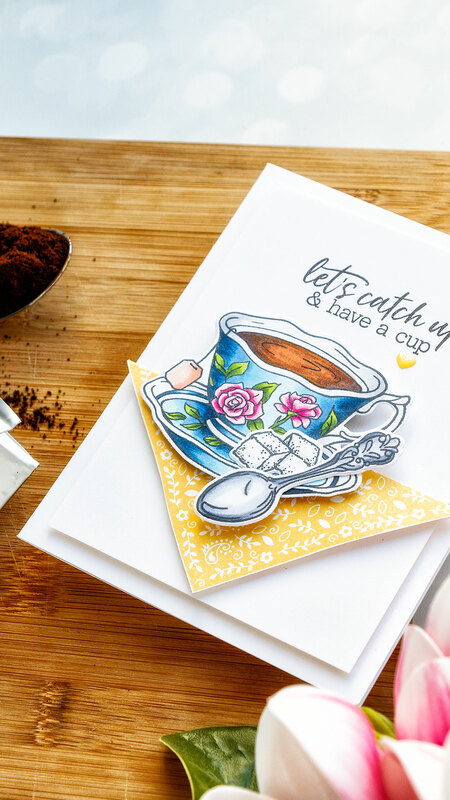 Hello everyone and thanks so much for stopping by to help celebrate the launch of Hero Arts August My Monthly Hero Kit (more about the kit, blog hop and giveaway below). I have 4 card ideas to share using this month kit and add-on items. 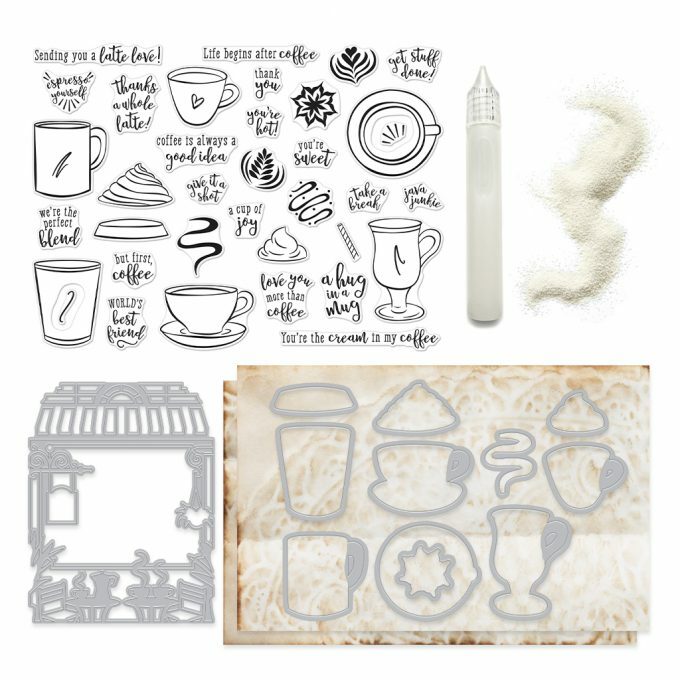 This kit is all about tea, coffee and all of the other yummy everyday drinks. The stamp set for this month features a lot of open outline images with a ton of white space and whenever I see an image like that I want to marry it with another stamp, with another image to add some pattern or some design to the original stamp. The technique I feature today requires masking – you need to stamp the image you want to mask onto masking paper and cut the inner open space portion of the mask out to create a reverse or negative mask. After stamping my image in Copic marker friendly ink I positioned the mask on top and used another stamp, Hero Arts Flower For Coloring, to add a pattern to my cup. I removed the mask and used my Copic markers to color this image. I used the following colors: B99, B34, B21, B000, RV09, RV14, RV13, RV11, RV10. 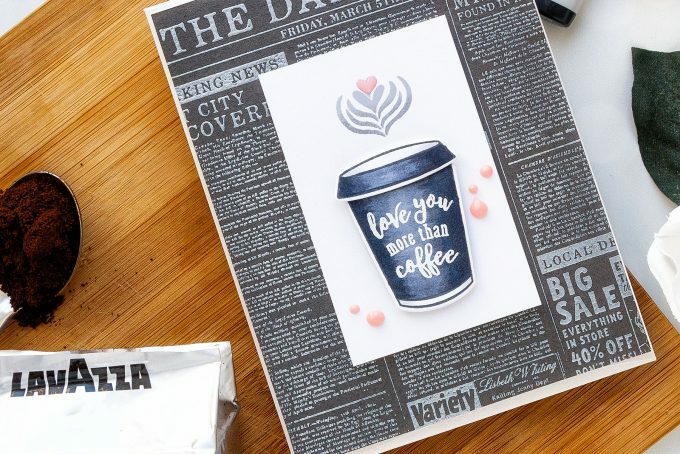 I cut the cups out using a coordinating die and also stamped little sentiments inside of each using Detail White and Black Sparkle embossing powder. I used a Newspaper Bold Print background stamp with Soft Pink ink to create a background for this card. 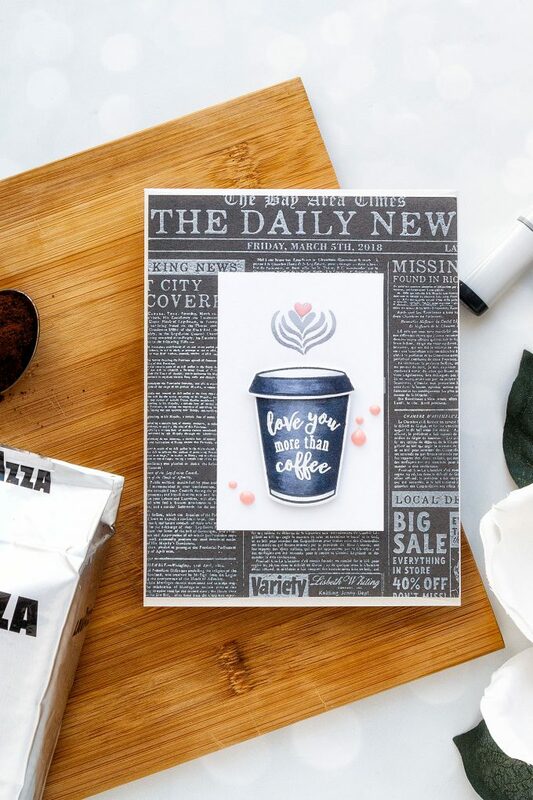 I foam mounted my images on top and added a simple “Coffee is always a good idea” sentiment. For my next card I once again used the same technique, but this time I gold heat embossed both the cups outline and my cup pattern. I used Flowers for Coloring and Newspaper Bold Prints background stamps and colored my cups with Copics. I only added the design to the cup itself, I skipped the saucer and the handle. I used the following colors: G05, G03, YG00, C5, Y35, Y15, Y13, Y11. I die-cut a shape using one of the coordinating dies out of white paper, almost a circle, I wanted to use a circle die, but I cheated here and I used that coordinating die instead, I gold heat embossed “We’re the perfect blend” sentiment and added that to my card. For the card above I stamped Newspaper background in Unicorn white pigment ink onto gray paper and heat embossed it in Satin Pearl White embossing powder for this satin pearl look. 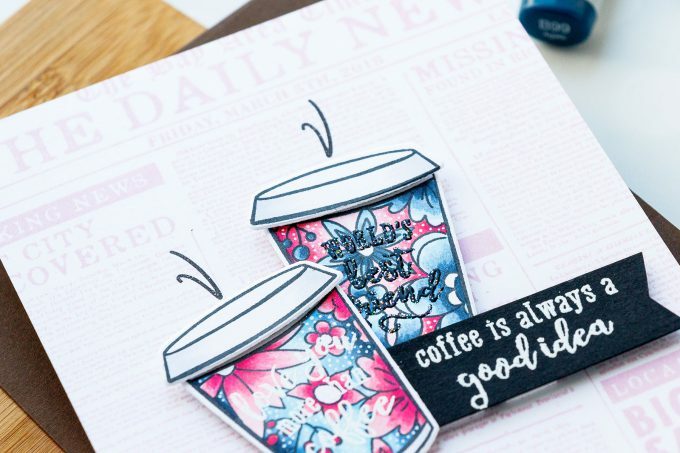 I also colored my coffee cup using C9, C7 and C5 Copic markers to make it look almost black and I added little pink accents using Nuvo Drops and enamel hearts. 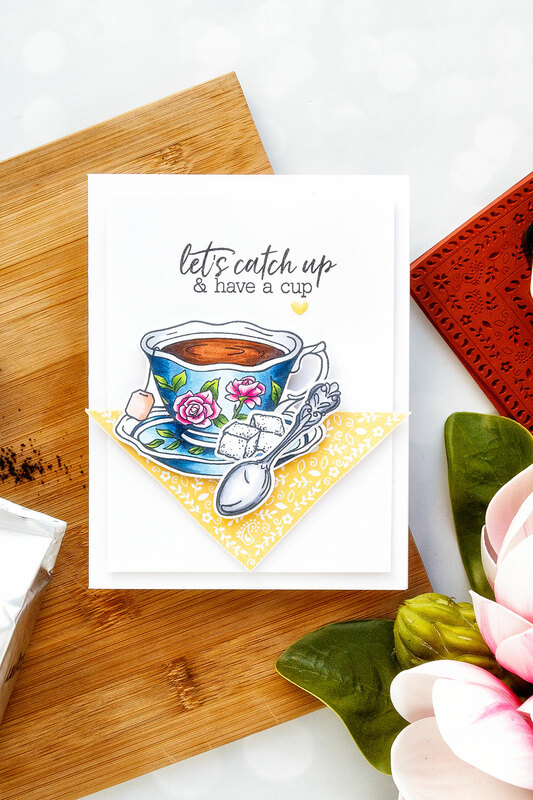 I also have one more card to share using the add on stamp set from this month – Spill The Tea set. I stamped, colored and cut out image of a tea cup (I used sam Copic marker colors as before), tea spoon and sugar. Next, I made a faux tablecloth by using Bandana Bold Prints background stamp and stamping it in Butter Bar ink. I folded it in half, using tape and foam adhesive to adhere it onto a background panel and foam mounted my colored and cut out pieces on top. 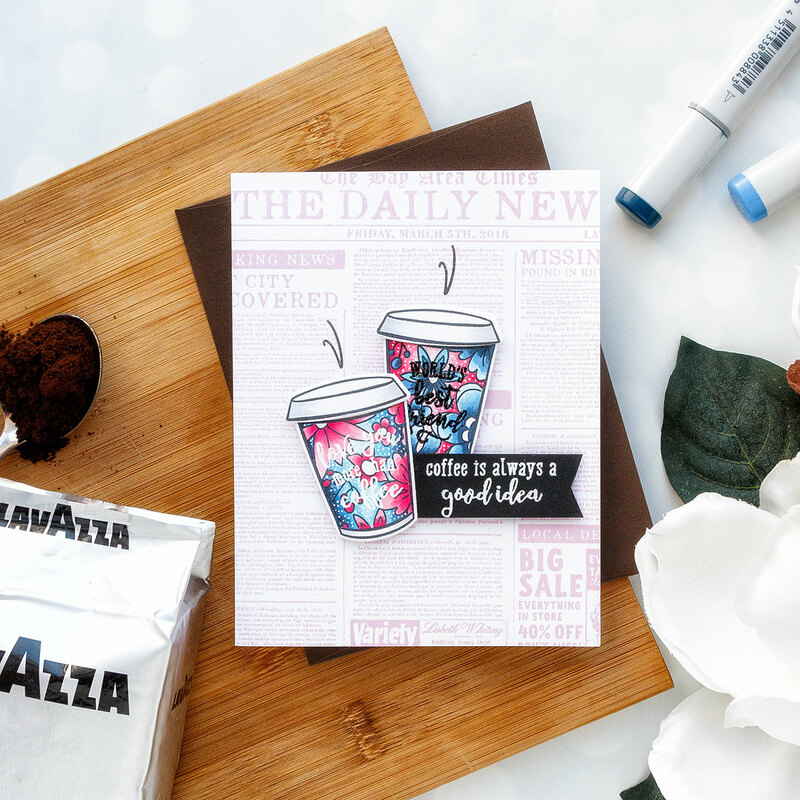 This really is probably my favorite stamp set from this release – I love that coffee cup and I think it’s an awesome image to practice coloring. I really look forward to using it again and again. Hero Arts is giving away one kit as a prize to one blog reader – selected from the comments across all of the blogs in the hop so be sure to leave a comment for your chance to win! The giveaway closes Sunday, August 12th at 11:59pm, and the winner will be announced the following week. These were great. I really liked seeing the dies in use! Wonderful set of cards. These are fabulous. I love all the intricate details. Your cards are beautiful and your video was great. So many ideas. 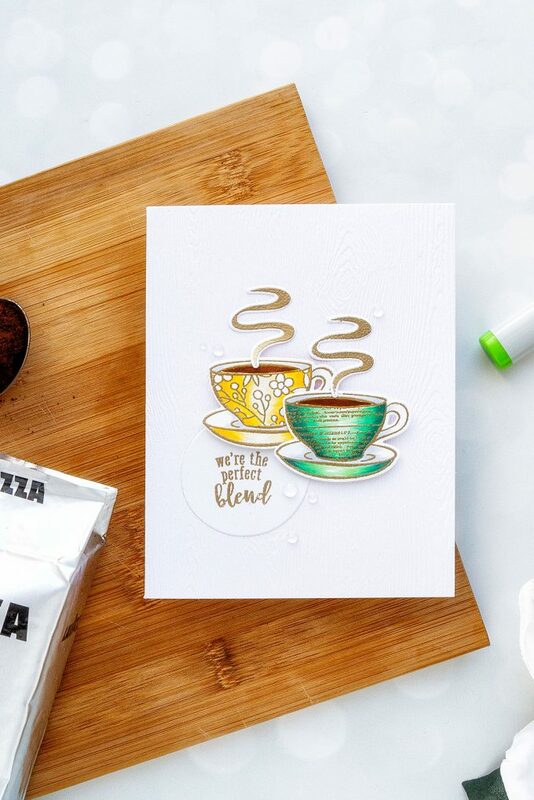 Lovely cards – thanks for sharing! colorful and smart cards. I especially like the background of the cards and the detailing on the cups. Great ideas here. Love your backgrounds and the way you styled them. Thanks for sharing. These cards are so beautiful! Love how you used the new products! Wonderful cards! Such beautiful designs and coloring. This is such a fun kit. Awesome cards Yana, I love all the cards. It’s great to see how you give the cups/mugs patterns and although you didn’t use and liked the last cup you made in the video, I loved that cup. My favorite card is the dark gray card with the little toutch of pink, stunning card. I love this kit and all the add-ons this month, thank you for all the examples and the great video you made with it. They all are AMAZING and GORGEOUS!!! I love how you created every scene on those cards. A great job. I really love your teacup with lets hook up verse. It looks so real. Great coloring. Great cards as always. =) Your teacup is cute! I love your blog! I really like seeing how you colored everything. I liked seeing the newspaper behind the coffee! I adore the napkin under the English tea cup — the perfect extra detail! 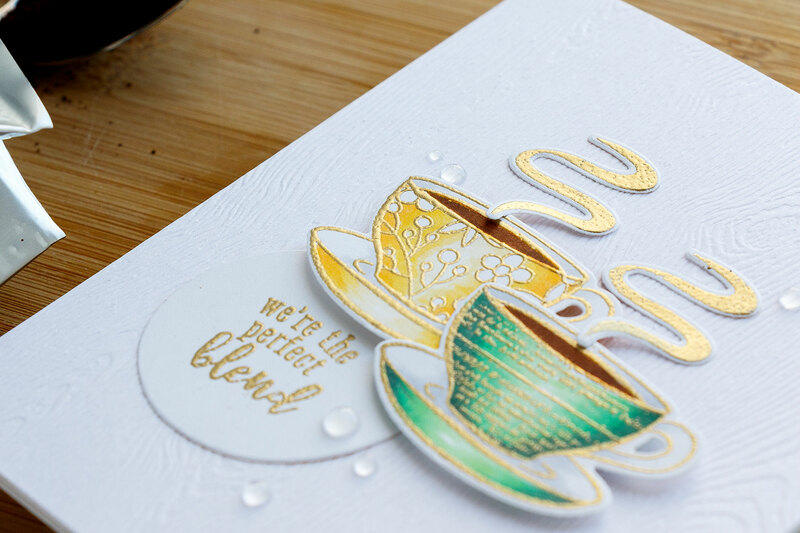 The gold embossing really looks gorgeous with these colors, and your teacup is absolutely beautiful. Thanks for the post. Sometimes I become speechless. Like right now. So beautiful! Thank you so much for the inspiration. I like the pretty cups on your cards. Stunning cards! Love how you coloured the stamps and I’m going to watch the video right now! Love that kit and by the way finding out about Hero Art monthly kit. Being both a coffee and tea drinker this kit would suit just fine. Thanks for the video full of nice tips. I love your style! Very lovely cards, thanks for the video too! Amazing projects – you always add so much detail ! Your videos are great – so nice to see the process first hand. Thank you for sharing your creativity with all of us! 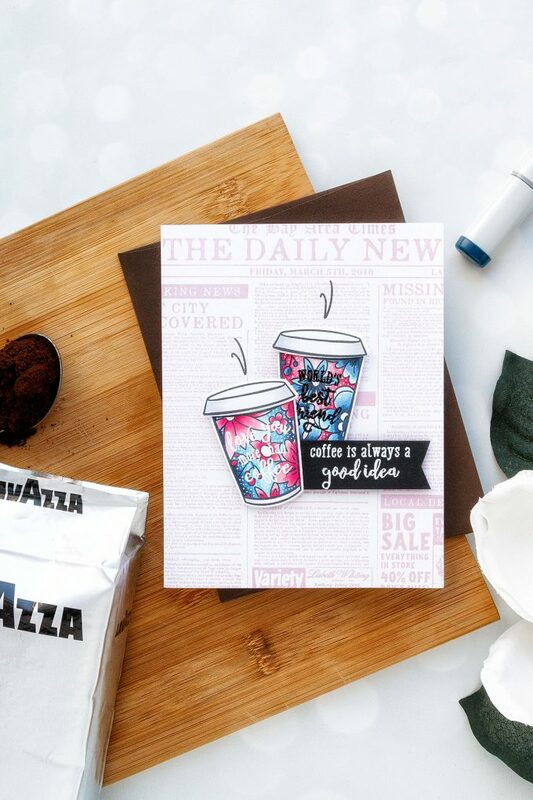 I love all your fab cup designs!! Spill the tea just makes my heart sing!! Wonderful video and beautiful cards! Love your fun masking ideas. I can’t get enough background stamps and your cards feature the use of some I’ve not seen before. Yummy! As is this entire kit! 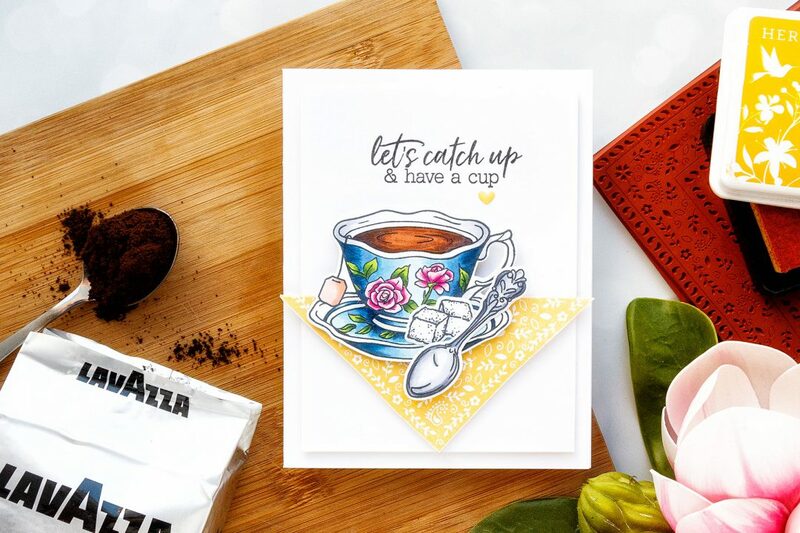 Cute cards-especially love the patterns on the cups. (Kind of like paper piecing but without all that cutting!) Also a good way to use different background stamps in a different way. Thanks for sharing! This kit is fabulous. So many possibilities. Adorable cards. Nice Yana! Those floral cups look really nice on that first cards along with the lighter newspaper background. Those gold embossed cups look very nice with the design on them and the colors. I like that sort of black and white look too. And such nice coloring on the teacup.